As this is the 4th crab cake recipe I have posted to The Right Recipe, I should offer a quick run-down. If you need to make crab cakes for a crowd, try the Oven Baked Crab Cakes with Two Dipping Sauces. For an Asian twist, you can’t beat Spicy Asian Crab Cakes. For an elegant and impressive sandwich, turn to Daniel Bouloud’s Crab Cake Sandwich. Now to the crab cakes at hand. These are from Magnolia’s, a fixture on East Bay Street in Charleston, SC. The recipe was published in Magnolia’s Authentic Southern Cuisine by Donald Barickman. They have a lovely balance of flavors and are simply chock-full of crab…the way all crab cakes should be. I especially love the preparation technique (see photo below) because you can put them together hours in advance and you’ll have slice-and-bake crab cakes at a moments notice. 1. Place onions, bell pepper, tarragon and mayonnaise in a mixing bowl and combine. Gently fold in the crabmeat. Add the panko and season with salt, white pepper and cayenne pepper to taste. Let the mixture rest for 5 minutes. The panko will absorb some of the moisture and the mixture will stay together. 2. Lay out a large piece of plastic wrap on a clean counter surface. Place half of the crab mixture on it and use a spatula or a spoon to form it into a tube about 1 3/4 inches in diameter. Bring the wrap up over the crab and roll the crab mixture up. Twist the ends to close. Pierce any air pockets with a toothpick or skewer. Twist the ends even tighter to compress the crab mixture. 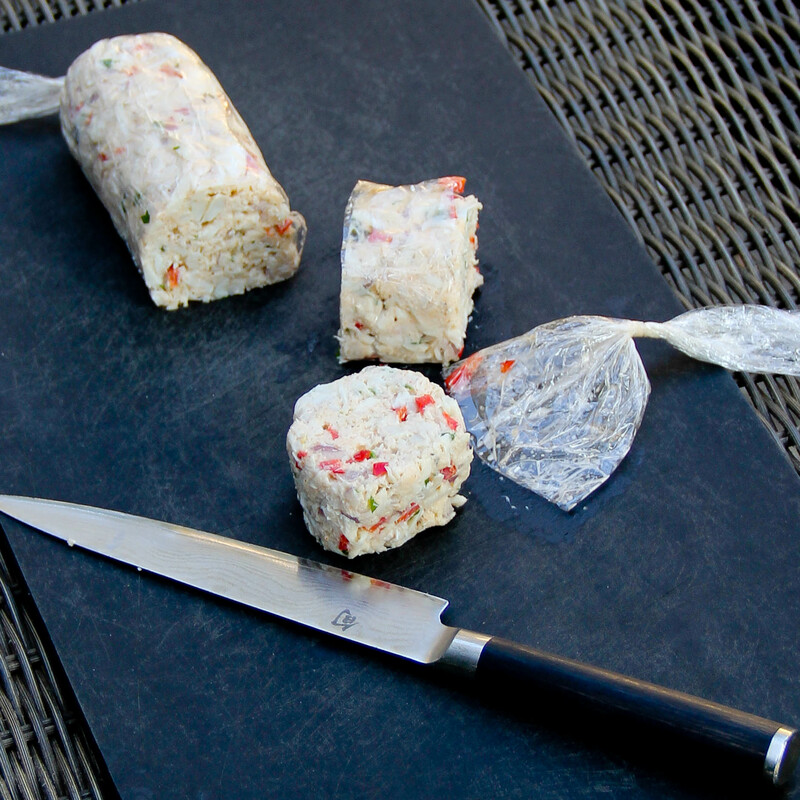 Tuck under the ends of the wrap and place the tube on a plate. Repeat with the second half of the crab cake mixture. Place the tubes in the refrigerator for at least 1 hour or overnight. Cut the tubes of crabmeat into 1 1/4-inch-thick cakes. Gently remove the plastic wrap, leaving the cakes in nice cylinders. Magnolias is great save for the fact that it’s on East Bay Street. Not to be confused with the seasoning Old Bay which, coincidentally, is a staple in many area crab cakes. oh wow, it sounds amazing! I love the way you make it into a roll and slice it. I want to try this soon! You have such yummy recipes on your blog. Oh my God! They look so crabby! Spectacular!